Here’s the first son of the popular syndicated Duff herd sire, DCC New Look 101. He has a striking resemblance to his sire, putting together incredible style, balance and correctness with a moderate frame size, amazing body shape, fleshing ability and great muscularity. 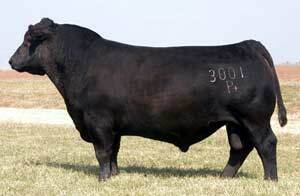 He also features a power-packed pedigree stacked with the most respected basic genetics in the country. His dam is a superb 6807 daughter out of the highest selling female ever at Ohlde’s, OCC 775C, an EXT out of Anchor’s dam. His calves are real standouts with extraordinary eye appeal and pizzazz. Use First Look to tone down frame, increase efficiency and enhance quality.